iPod PC Transfer will help you to transfer the music, video and playlists from iPod back to the iTunes library. It works with all type of iPod (including iPod Touch), and very easy to use. Combine with iPod PC Transfer Photo, you can always transfer the content of iPod to any computer easily.It has the ability to search for the songs easily.You can save the output music files with the Aritist,Album as the way you like with the fastest copy speed. Easy Copy the music and videos from iPod to PC with iPod PC Transfer. ...... It works with all type of iPod (including iPod Touch), and very easy to use. Combine with iPod PC Transfer Photo, you can always transfer the content of iPod to any computer easily. There are a lot of reasons you will need iPod PC Transfer. For example, you may want to backup the music of your iPod or iPhone, to use your iPod with a new computer, to copy songs to your new iPod, or to use your iPod in more than one computer. Your music library is priceless. With iPod PC Transfer, you can transfer music from iPod to computer, and copy songs, playlists from iPod to iTunes easily, no matter what happened, you can always restore your music library from iPod or iPhone. * Copy music and video from iPod to PC. * Copy music and video from iPhone to PC, iTouch to PC. 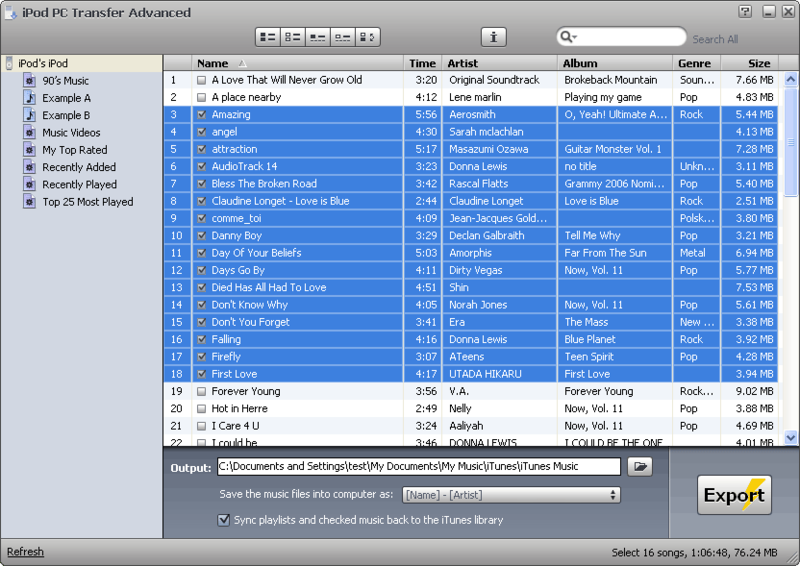 * Transfer songs, video and playlists to iTunes library (Advanced edition). Manage iPod contents and transfer iPod videos. Lenogo iPod to PC Transfer is an application for transferring songs from iPod. Transferring songs and videos from your iPod to PC. Transfer music/video among iPod, iPhone and PC along with much more functions. Transfer video audio from ipod to computer. Transfer your iPod/iPhone music/video/playlist/photos back to PC and iTunes. Qweas is providing links to iPod PC Transfer 6.3 as a courtesy, and makes no representations regarding iPod PC Transfer or any other applications or any information related thereto. Any questions, complaints or claims regarding this application iPod PC Transfer 6.3 must be directed to the appropriate software vendor. You may click the publisher link of iPod PC Transfer on the top of this page to get more details about the vendor.